Hotel Sun Shine is a 2 star deluxe hotel located in Kashipur, Uttarakhand. The hotel is ideal for both business and leisure travellers. 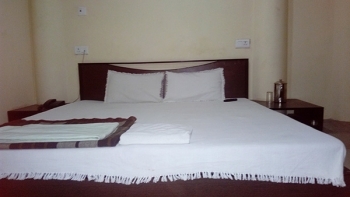 The well furnished accommodation caters every need of guests and provides a warm hospitality. The hotel is located near GGIC school Kashipur, ideally situated half kilometer from city center. With prompt room service and best amenities, the hotel making their guests staying experience comfortable. The hotel is located on Jail road near Chatri Chauraha, just 500 mtrs from Kashipur Bus Station. The hotel offers 12 Standard rooms equipped with all modern amenities and facilities. Each room has AC, LED TV, wardrobe, free WiFi and attached bathroom. The hotel serves variety of mouth watering cuisines in its well decorated restaurant. Guest can also use the fast room service to dine at room only. Kashipur is well connected by road to aal major cities like Dehradun (238 kms), Delhi (220kms) and Haridwar (177 kms). There are regular buses from Delhi to Kashipur. The hotel is at 500 mtrs from Kashipur Bus Station and 850 mtrs from Railway Station.